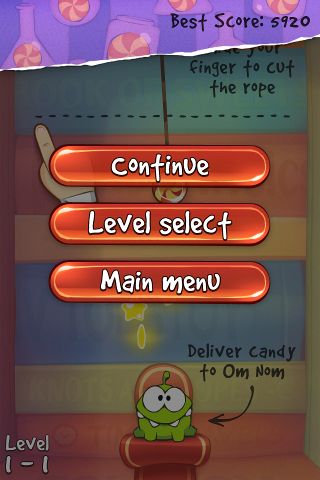 "Cut The Rope" and "Pudding Monsters": Changes to "Cut The Rope" ver. 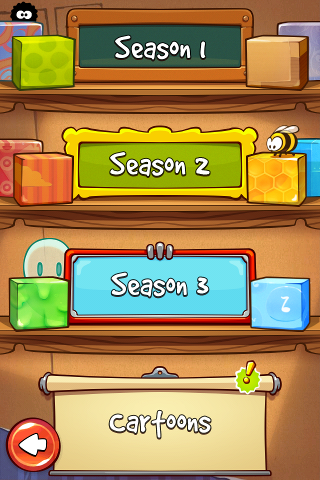 2.0, "Cut The Rope: Experiments" ver. 1.5, "Cut The Rope Free" ver. 2.0, etc. 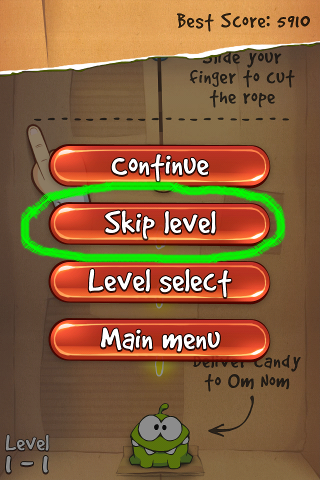 Changes to "Cut The Rope" ver. 2.0, "Cut The Rope: Experiments" ver. 1.5, "Cut The Rope Free" ver. 2.0, etc. 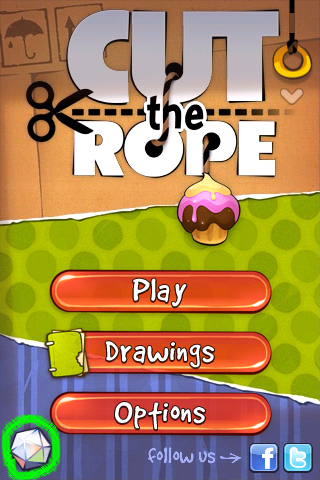 ZeptoLab suddenly released NEW versions of its apps for the iOS platform: "Cut The Rope" ver. 2.0, "Cut The Rope: Experiments" ver. 1.5, "Cut The Rope Free" ver. 2.0, etc. 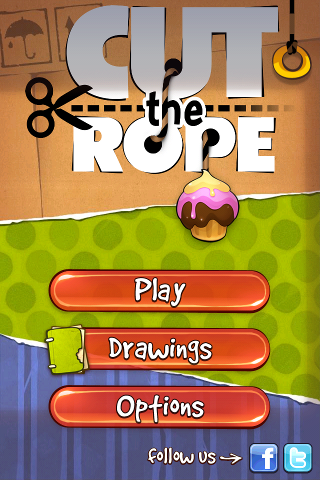 For "Cut The Rope" ver. 2.0, the present 12 boxes are now located as follows: 1st 5 boxes (Cardboard, Fabric, Foil, Magic and Valentine) in "Season 1" sub-menu, next 5 boxes (Toy, Gift, Cosmic, Tool and Buzz) in "Season 2" sub-menu and the remaining boxes (11th DJ and 12th Spooky) in "Season 3" sub-menu. "Cut The Rope Free" ver. 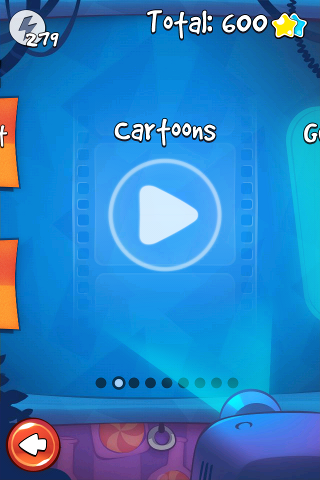 2.0 (only 18 levels, 9 in "Cardboard Box" and 9 in "Fabric Box") has ads located at the bottom of the menu screens, as shown above. 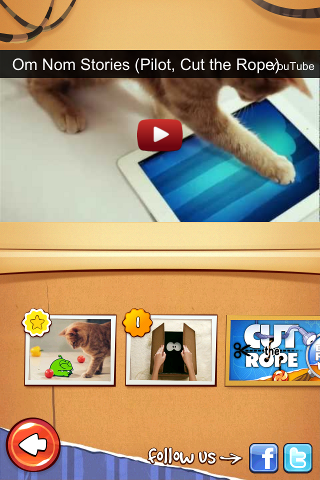 The above screenshot was taken from "Cut The Rope Free" ver. 2.0 for its Level 1-1. 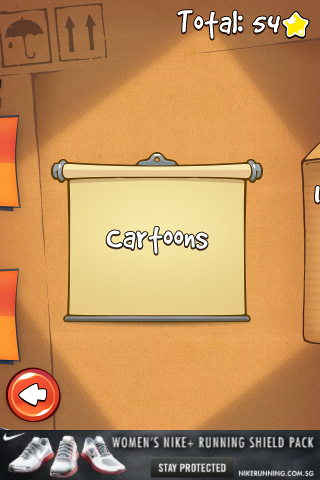 The above screenshot was taken from "Cut The Rope: Experiments" ver. 1.5 for its Level 1-1. (4) The new versions of the apps cannot get updated for older iOS devices like iPhone 3G and older generations of iPod Touch because the new app versions require iOS ver. 4.3 or newer for the SD (iPhone/iPod Touch) version while older devices like iPhone 3G can only install up to iOS ver. 4.2.1 in them.